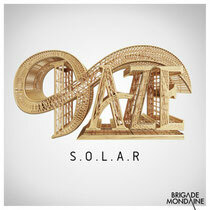 Bridade Mondaine (Vice Squad in English) is the latest alternative beats and house imprint from French electronic label, Police Records.The label's debut release is from rising act, Daze, a talented young Parisian producer, churning out nu-funk grooves with his vintage synths, vocoders and talkboxes. Daze explains: "When I was a kid, my favourite past time was spent listening to the great funk teachers like Cameo, Zapp & Roger, D-Train, Skyy, Midnight Star, George Clinton and all the New-York Funk underground musicians. Funk will always be an important part of my life and music." Currently riding high in the iTunes dance charts in France above Justice and Boys Noize, Daze makes music without any samples, using only his vintage synthesizers like his "teachers" did years ago, this is real music sans the CGI. S.O.L.A.R (which means Sound Of Love Around Radios) is all about funk and emotions. It’s out July 15. In the meantime, grab this free download of his track ‘Something On Your Mind’.